Please place your orders a minimum of 5 days in advance. We provide everything but tablecloths and decorations (delivery is available for an additional fee). Click here to download a copy of our Catering Menu for Bayou Wine Garden and Bayou Beer Garden. We also seasonally cater crawfish for private parties (inquire for pricing). I'm interested in having my private party at the Bayou Gardens. How much does it cost to reserve a space? There is no fee for reserving a space in the Bayou Gardens. There is also no minimum on food or drink orders to reserve a space... we are happy for you to just bring your group to our establishments and let them buy what they will! There is a $250 deposit required at the time of your booking that will be refunded the day of your event. Your reservation is not secured until this deposit is paid. If you would like to reserve a space in the Bayou Gardens during Saints and LSU games, there will be a $500 minimum in the Brick Room and $750 minimum in the VIP Area. Phone calls are always recommended to complete a party reservation to help avoid any miscommunications about your wants and needs. For more information and to reserve a space at the Bayou Gardens for your planned event, please contact Zada at (504) 909-9083 or events@bayoupartnership.com. Same Day booking inquires, please contact Zada directly. That sounds great... how do I reserve a space for my private party? For more information and to reserve a space at the Bayou Gardens, you can fill our contact form, contact Zada at (504) 909-9083 or events@bayoupartnership.com. Same Day booking inquires, please contact Zada directly. Pssst... the same person books parties for Bayou Wine Garden, Bayou Beer Garden and The Holy Ground Irish Pub. I have "X" amount of people invited to my party... which space would you recommend? There are minimum group sizes for different spaces (some exceptions may be made based on the day, at our discretion – call (504) 909-9083 for more info!) Please call, rather than email, if your party may be more than 100 people. 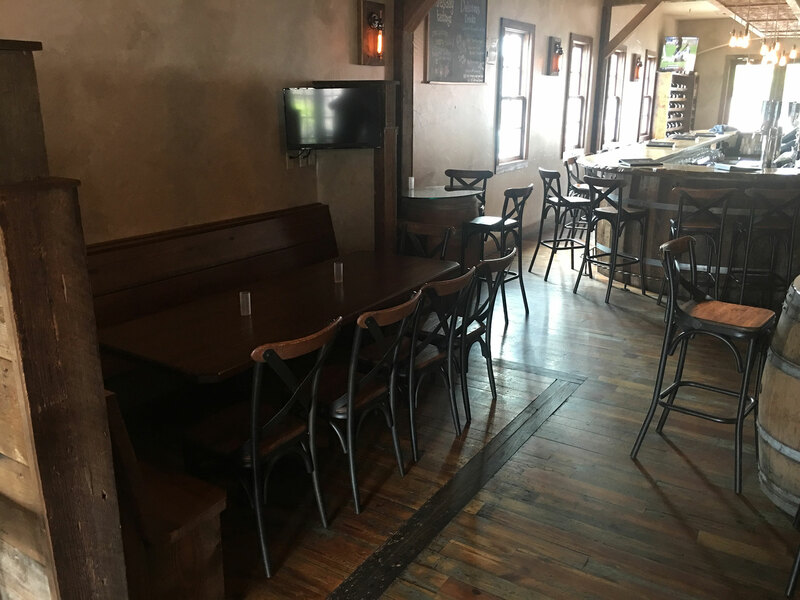 You may also rent out the entirety of Bayou Wine Garden’s Inside Bar (including Back Porch, but not Patio Area) for events ending by 2pm. This area will accommodate from 60-90 People. We also have Private Buffet Style Brunch and Private Group Wine Tasting options available. Please note: We do not do complete buy-outs of our properties. If you would like to reserve a space in the Bayou Gardens during Saints and LSU games, there will be a $500 food and beverage minimum in the Brick Room and $750 food and beverage minimum in the VIP Area. For more information and to reserve a space at the Bayou Gardens for your planned event, please contact Zada at (504) 909-9083 or events@bayoupartnership.com. Same day booking inquiries, please contact Zada directly. Are there any limitations on what/when I can book my event? We can not allow anyone under 21 years old, this includes children. Absolutely no outside food or drinks are allowed. NO EXCEPTIONS. If you would like to reserve a space in the Bayou Gardens during Saints and LSU games, there will be a $500 food/drink minimum in the Brick Room and $750 food/drink minimum in the VIP Area. Please contact us to reserve space for major sporting, city events and festivals. This will be considered be management on a case by case basis. We do not allow wedding ceremonies, but receptions or after parties are welcome! For more information and to reserve a space at the Bayou Gardens for your planned event, please contact Zada at (504) 909-9083 or events@bayoupartnership.com. Phone calls are always recommended to complete a party reservation to avoid any miscommunications about your wants and needs. Can I have raw oysters, chargrilled oysters or boiled crawfish at my event? Yes, but crawfish and oysters are offered seasonally. Please call us for availability and pricing. For more information and to reserve a space at the Bayou Gardens, please contact Zada at (504) 909-9083 or events@bayoupartnership.com. Can I have guests at my party under the age of 21? No. Your guests must be 21 years of age or older... this includes small children. Can you do customized catering for my event? While we have posted catering food and drink menus online, we can customize orders beyond the options listed, and will do whatever we can to tailor your event to your needs! We also can provide custom professional cakes, which can include writing your special message. Please contact us for more information. We provide everything but tablecloths and decorations. Water stations are located near or in every party area, but bottled water is also available upon request for $20 a case. Do you offer valet service? Private valet is an option for your parties! Please call for more information. For more information and to begin the reservation process, please contact Zada at (504) 909-9083 or events@bayoupartnership.com. There is no fee for reserving a space in the Bayou Gardens. There is also no minimum on food or drink orders to reserve a space. We are happy for you to just bring your group and let them buy what they will! Please note: There will be a $250 refundable deposit to reserve a space. If you would like to reserve a space in the Bayou Gardens during Saints and LSU games, there will be a $500 minimum in the Brick Room and $750 minimum in the VIP Area. Your space is NOT reserved until we contact you directly. We will contact you as soon as possible and thank you for your inquiry. For more information and to reserve a space at the Bayou Gardens, fill out the form above, contact Zada at (504) 909-9083 or send us an email at events@bayoupartnership.com.